August 7, 2013 by Rob Triggs, CRM Dynamics Ltd.
We now have tools that make the sales processes I have used for the past 20 years so much simpler. In my first post I discussed the background, and now I want to share 3 simple ways you can use CRM software to increase your company's revenue. 1) Activities- Define the important high value activities for your business and use the CRM to track them. Depending on what you sell the simple activities are cold calls, lead follow up, presentations, demonstrations, proposals, closing calls, customer maintenance. Build dashboards so sales people and management can monitor the number, frequency, and outcome. Track and measure these lead indicators of success rather than lag indicators such as orders and % of revenue to plan. Use a coaching model when reps are not performing. If you “beat up” sales people for their activities tracked in CRM rather than encouraging, them they will see the CRM as the enemy. 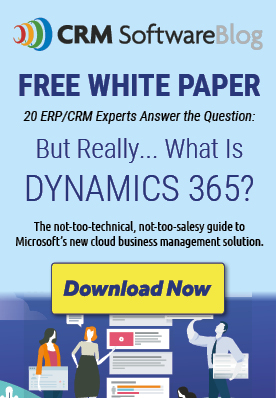 CRM must be easy to use and an enabler to sales, not a deterrent. So define your high value activities, track these in your CRM, monitor with dashboards, and schedule coaching sessions to help your sales people. 2) SMART Data- When I cold called I was rarely greeted with “hey, great to see you. Come on in we want to buy what you are selling”. I used the opportunity to gather valuable information about the company so I could build an account penetration strategy for each company I cold called. If you have invested in specific sales methodology such as solution selling, TAS, Sandler…leverage the investment in sales training with SMART data. With SMART data you can do your research without even leaving your desk. SMART data is information about the company and contacts in those companies you can use to build solid account plans. Information that sales can use is now available in the public domain. The tool we use is called InsideView. It grabs data from over 30,000 points on the internet and brings it back into your CRM for account planning. This makes it much easier to do appropriate account planning on large, medium, and even small opportunities. Please click this link to learn more about SMART data. I am hosting a webinar on this topic August 27, 2013 1PM EST. Register HERE. 3) Marketing Automation- My secret to success as a rep and sales manager was the same. High level of activities. Cold calls, lead follow ups, demos and presentations. With marketing automation tools, each sales rep can cover more ground with structured email campaigns that are tracked by the CRM. You can have hundreds of demos happening each day on autopilot. You can track these activities in CRM. You can set up nurturing campaigns to walk a prospect from introduction to paying customer with little or no involvement from a direct sales person. You can engage a prospect from the minute they land on your web site. You can start your sales process by tracking their activity on your web site. Apply structured sales process to email marketing and web traffic. Track all this in CRM. We use a tool called Click Dimensions. It sits inside your CRM and gives you amazing capability to attract and land new customers. This opens the door to a new sales coverage model. Those who see it will win; those who don’t, will struggle. In summary: Very few things in life actually change. The basics normally remain the same. In sales not much has changed either. We still need to meet new companies to nurture them into buying what we sell when there is a fit for what we sell and when the time is right for them. We must perform high value sales activities to nurture our prospects through our sales process. We must leverage new technology to cover more ground than our competitors (just like when cell phones came out) and we must simplify the selling process for our people using tools such as CRM. For more information on how to use your CRM to increase sales, please visit our website. I hope you enjoy being part of our sales process. SIGN UP to receive our newsletter and other useful information for growing sales. If Oprah Can Walk on Hot Coals, You Can Unleash the Giant Within your company- Can your company survive tough times?